Paris may have some of the best (and most expensive) restaurants in the world, but for those hoping to save a little money or looking for something a little bit different while about town, here are the top five spots for street food in Paris. Ah Paris: the land of soufflés and escargot, of fine vin and decadent fromage. Yet, for those of us who aren’t living on Cloud Nine, life isn’t all snails and cheese. The real world of Paris isn’t entirely clichés out of your grandmother’s cookbook, and thus there are many low-budget, comparatively exotic alternatives to the high-end world that ends up in most travel guides. So Voila! The street food of Paris is waiting to be tasted. Just a stone’s throw away from the grand Notre Dame Cathedral is a winding road of humongous Greek eats. An “Extra Pita Grecque,” for 4.50 euros, is the best fast food around. 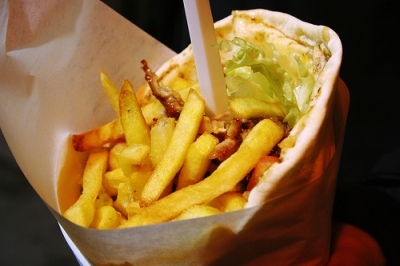 A large pita is stuffed with predominately chicken shawarma, cut from a rotisserie of meat at the window, then lettuce and tomato is added, and finally the pita is filled to the top with French fries. If you’re lucky, you’ll get extra “sauce blanche,” or tzatziki, a creamy yogurt-based cucumber and garlic sauce. There are variations of the “Grecque” at these stands, but your best bet is the massive sandwich, to be eaten inside if there’s room or taken on-the-go to continue your tour of the Left Bank. To fit in like a true European, eat the fries inside your sandwich with a fork. Directions: Metro Saint-Michel. With your back to Notre Dame, facing the Saint Michel fountain, the winding street is your first left. From Greece to Israel, the Jewish Quarter’s renowned Rue de Roisiers is unparalleled for its falafel variety. A 5-euro falafel can be yours at one of many restaurants along the street, though be prepared to pay more if you plan on dining inside. Hummus generally comes pre-spread inside along with vegetables and the trademark bean patties. Spicy sauce is almost always available, whether at your table, at a buffet-style cart, or on-demand at the window. With the diversity of options and the competitive pricing, Rue de Roisiers is the go-to spot for a falafel craving . . . or any hunger pang at all. Directions: Metro Saint-Paul. Rue de Roisiers can be found to the right of the carousel. Despite the international nature of Parisian street food, there are still affordable French feasts to be had. For the starving artist traveler, there is nothing more cliché (or less expensive) than a baguette to make a filling meal, ultimately washed down with cheap red wine. A baguette of bread is a quintessential side to a complete French meal, like a glass of water — if there’s no baguette with dinner, then it’s not dinner. However, it must be said that the nearly lawful nature of baguette is confining. A true Parisian would never eat a loaf of bread as the meal, even if imagining dinner without bread is equally absurd. Instead, they nibble on sweets and sandwiches. Any Patisserie or Boulanger (pastry shop or bread baker) will have a comparable variety to any of the touristy sit-down institutions. Affordable macarons, viennoises, and occasionally specialty sandwiches are almost always under 5 euros. Macarons and viennoises are the two quintessential French sweets. A macaron is a small, almond-based round cookie with two medium-to-hard exterior halves framing a creamy middle. Macarons (pronounced mack-a-rawn in French, with emphasis on the last syllable but not on the “n”) come in a variety of “parfums” or flavors, and vary from place to place. Vanilla, coffee, chocolate and pistachio are the more common flavors. Try a brightly colored one for the more unlikely taste. A viennoise (which translates to a “Viennese,” or a local of Vienna) is a soft, sugary bread, best filled with chocolate chips. Ranging from around 1 to 2 euros, they can be anything from a handheld guilty pleasure on the go to a “pain viennoise,” a large, ripple-topped bread roughly the length of an arm. These delicacies are easily found at one of many patisseries and boulangeries around Paris, but each one is slightly different. For a hulking and delicious pain viennoise chocolat (a viennoise-style bread with chocolate chips), try the Patissier at the end of Avenue Carnot, Maison Hardot, a quiet destination near the bustling tourist traps near the Arc de Triomphe. The famous arch is the star of many avenues beyond the Champs Elysees, and Carnot is a safe haven that’s only five streets from the Champs, where thankfully tourism is not a draw. The bread here is always fresh due to the demand of locals buying their dinner bread on the way home from work. Patissier is an escape to the real world of the working Parisian, even with the epic Arc de Triomphe within walking distance. 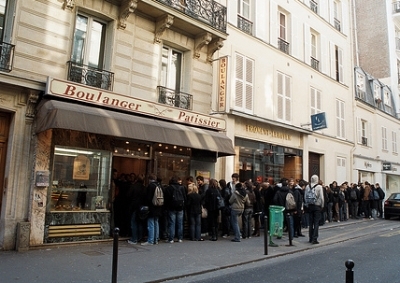 On a nice day it’s worth toughing out the occasional line at the boulanger on Rue Vavin, where the hand-held viennoises are brimming with chocolate for only 1 euro. Vavin Boulanger also has an excellent and ever-changing variety of sandwiches for under 4 euros. This nameless Vavin Boulanger has friendly service despite the crowds and is adjacent to the resplendent Luxembourg Gardens, so you can take a comfortable stroll with your treat around the beautifully clipped greenery, both a favorite for locals and visitors alike. If you’re up for some walking, the garden provides a shortcut across to Boulevard Saint-Michel, where the Greek and Tunisian options abound. Directions: Maison Hardot. Metro: Charles de Gaulle Etoile, Sortie Ave Carnot. Continue straight from the metro until you come to the large, blue corner-building directly in front of you. Directions: Boulanger. Metro: Vavin. Sortie: Boulevard Raspail. Cross Raspail and bear left on the first side street, Rue Brea. Turn right onto Rue Vavin. It’s towards the end of the street, just before the Luxembourg gates. In Paris, crêpes can be eaten any time, any place, any where. 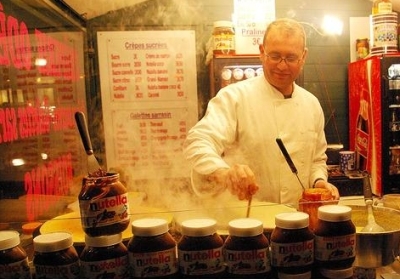 There are breakfast crêpes and dinner crêpes; restaurants serving high-end crêpes and corner crêpe stands. The quick and easy solution is a street crêpe, especially late at night. Starting at under 2 euros for a plain sugar option, crêpes of all flavors are served at all hours. Sucré (sweet) or Salé (salty), the boulevard Montparnasse has stand after stand of budget crêperie options, rarely exceeding 6 euros. The best thing about street crêpes is that they’re often served extremely late. So after a late night out, a 3-euro crepe may be just what you need. Deliciously decadent favorites are the nutella and banana combination, and the “Chantilly Maison,” or the “house whipped cream.” Crêperie Henri is particularly delicious, with a second stand that opens in the evenings just to serve the surplus party crowd. Churros and gaufres (waffles, sometimes covered in chocolate or cream) are also available. Directions: Metro Montparnasse, Sortie Boulevard du Montparnasse. Crêperie Henri is directly to the left of the exit. All around Paris, the world’s food is represented on a budget of under 5 euros. If you’re craving cliché romantic foods, or if you’re looking for an escapist exotic snack, Paris has got you covered. So don’t worry that you’ll miss out on good eats if you skimp on escargot; just take to the streets, save a little cash, and enjoy Paris in all its culinary glory.